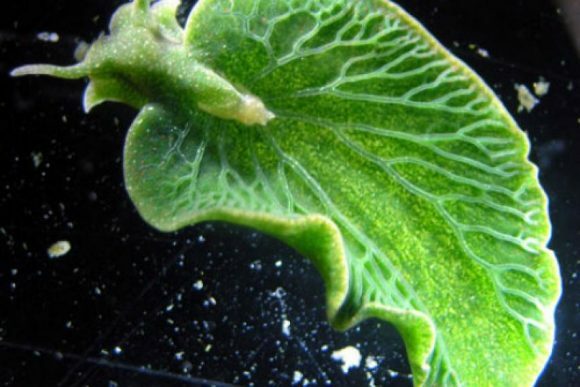 Emerald Green Sea Slug Can Live Without Foods For Months! You are here: Home / The Species / Emerald Green Sea Slug Can Live Without Foods For Months! In school, most of us were taught that plants find foods and live from a ‘cooking’ process called photosynthesis. In this process, plants convert carbon dioxide (CO2) and nutrients from the soil using sunlight as the ‘fire’ to get the energy they need. The outcomes of this process are oxygen that we inhale and energy-rich organic compounds. Thus, we know that most oxygen that we breathe in every day is the result of those plants’ work. But don’t you know that it is not only plants that do such work in this planet? 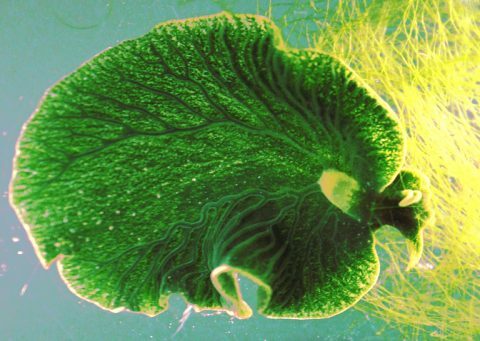 A creature called emerald green sea slug does this ‘cooking’ process too to get the food they need. What’s interesting from this creature is, it got the ability from ‘stealing’. In this article, we are going to talk about this ‘thief’ and how it does the wonder. The name is Elysia cholorotica, a small-sized sea slug commonly found in Northern America. This slug can be found in any water body such as salt marshes, tidal marshes, pools and shallow creeks, not deeper than half a meter. Just like its name, it has green color that resembles the color of algae it feeds on. Using the resemblance of color, it also uses it as self-defense mechanism by camouflaging. 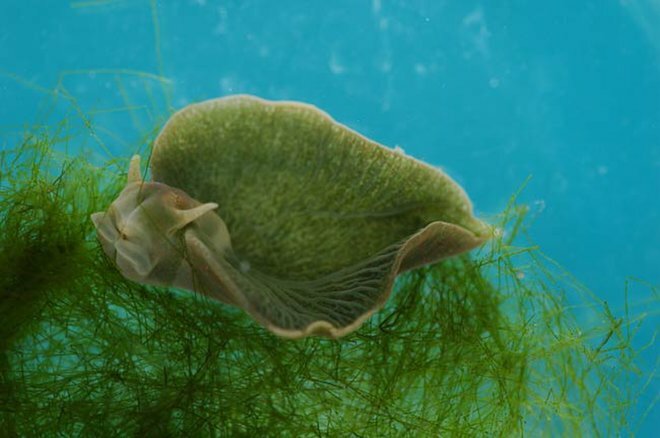 By grouping together with algae, it can trick predators into thinking that this creature is a plant instead of a mollusk. This creature is a simultaneous hermaphrodites, meaning that it can change its sexuality to both male and female. However, self-fertilization is not common in this animal, emerald green sea slug prefers to suit their sexuality into the other emerald green sea slug it meets and then copulate. Just like mentioned before that this mollusk feeds on algae, the energy obtained from feeding is not the only thing they need. They also feed on algae for a strange reason: harvesting the chloroplast from the plant. Up until now, this is the only animal on earth known to do such thing. And the reason for them to harvest the chloroplast from algae is not less strange, because they want the ability to photosynthesis themselves. It wasn’t an old story even among scientists that this slug can perform photosynthesis by itself. Instead, it has been an ‘urban legend’ for them. For decades, the assumption has been spread yet there was no direct evidence that emerald green sea slug can do this process by itself. However, after 40 years of study and experiments, scientists finally found out that this sea slug can really do it. A study conducted in Germany in 2013 found the direct evidence researchers needed to make the conclusion. It satisfied the soul of researchers who have long been curious about this green slug. “There is no way on earth that genes from an alga should work inside an animal cell, and yet here, they do. They allow the animal to rely on sunshine for its nutrition,” said Sidney K. Pierce from the University of South Florida in the US, one of the researchers participating in the study. By using its ability to create the nutrients by itself, this slug can survive longer when there is no food can be found around. “if something happens to their food source, they have a way of not starving to death until they find more algae to eat,” said Pierce. This process of photosynthesizing allows the slug to survive for a very long time without consuming any algae, its main source of foods. Merely depending on sunlight, water, and carbon dioxide, this slug can survive up to nine months. Emerald green sea slug didn’t manage to produce chloroplasts by itself, instead it steals the organelles from the algae it consumes. 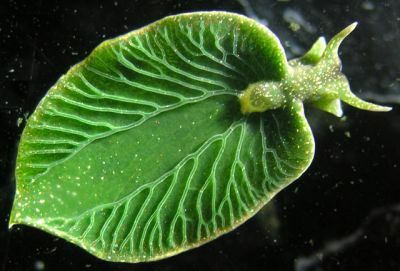 When consuming the algae, this sea slug doesn’t digest the chloroplasts, but it extract it and distribute the green organelle throughout the body. But as Pierce mentioned before, it needs more than simple extraction from the algae to make this animal able to do photosynthesis process. Mere extraction will only result in the green color without making the creature able to perform the ‘cooking’ ability. 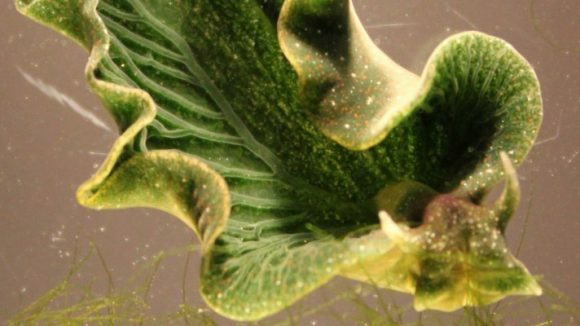 The thing is, emerald sea slug’s chromosomes contain genes from the algae which are able to code chloroplasts proteins to do the work. “This paper confirms that one of several algal genes needed to repair damage to chloroplasts, and keep them functioning, is present on the slug chromosome,” said Pierce. Such genes are some kinds of natural heritage, gained from the ancestors of the slugs after a very long processes. Modern emerald sea slugs are able to perform this action since birth because the genes inherited from their ancestors are present in their bodies. “This paper confirms that one of several algal genes needed to repair damage to chloroplasts, and keep them functioning, is present on the slug chromosome. The gene is incorporated into the slug chromosome and transmitted to the next generation of slugs,” Pierce explained. Studying the process of how this slug can develop the ability to photosynthesis might be useful for humanity. It opens up the possibilities for us to produce foods by ourselves! Well, if you don’t mind to be green, though. But that’s not the point. The most important thing in studying this animal is about finding the way a creature can self-produce nutrients and energy it needs to survive. It has the potentials to solve the world’s hunger and even the dirty energy consumption. The problem is, this sea slug is so rare and hard to be found in nature. “If you don’t know exactly where you’re looking and what you’re looking for, you won’t find it,” said Mary Rumpho-Kennedy, a retired researchers who had been studied about this creature for decades. The reason why this slug gets rarer and rarer each day is because of the destruction of its habitats. Sea level rise and climate change have been the main causes, and both are the results of man-caused global warming. “This habitat may be suffering or growing increasingly ephemeral, more than people appreciate,” said Patrick Krug, a biologist at California State University, Los Angeles, who has been studying about this creature too. “To follow up on this, somebody would have to find a way to raise a lot of these sea slugs. The scarcity of the animal is the problem,” said Debashi Bhattacharya, another researcher fell in love with this creature. Flowers Can Hear The Buzzing Bees, Can We Use It To Help Us?